Interstate 495 parallels U.S. 13 and the Delaware River east of Downtown Wilmington. The freeway begins at the Interstate 95 & 295 interchange complex near the city of Newport. East from there the six-lane highway travels between the Christina River and a landfill to Rogers Corner and the South Bridge section of Wilmington. Turning northward by the Port of Wilmington, I-495 elevates onto a high level bridge across the Christina River. Travelers crossing the span are afforded views of the distance Delaware Memorial Bridge to the southeast and the Wilmington skyline to the northwest. Advancing northward, Interstate 495 touches down on Cherry Island adjacent to another landfill as the freeway meets the east end of 12th Street (Exit 3). An adjacent interchange (Exit 4) serves the former Dupont industrial complex adjacent to Edgemoor and Fox Point State Park. Beyond there, I-495 parallels U.S. 13 (Governor Printz Boulevard) to the west and a Norfolk Southern Railroad line and the Amtrak Northeastern Corridor to the east as it lines the Delaware River north to Claymont. The freeway diverges from the adjacent river at U.S. 13 (Philadelphia Pike) before merging with I-95 at the the Pennsylvania state line. Did you know when I-495 in Delaware was originally built in the late 70s, it was a four lane pike and then before it was opened but after the concrete was down, a decision was made to make it six lanes? This decision delayed the opening for a few months. Between 1979 and 1982, the Wilmington Viaduct along Interstate 95 was reconstructed. During this project through traffic was diverted onto Interstate 495 coinciding with a designation change where I-95 was rerouted to bypass Wilmington and the former route was temporarily changed to Interstate 895. AASHTO approved the renumbering of I-495 as I-95 on June 28, 1978 and the reversion to the original numbering on November 14, 1980. Sometime in 1987 or so, an Interstate 495 shield fell off an overhead sign on the I-95 northbound approach to their split, revealing both freeways as Interstate 95. The entire sign was subsequently replaced, remaining in service until 2000 when DelDOT replaced the last three 1980s-installed sets of overheads for the I-95 and 495 partition. Originally there were only four interchanges along Interstate 495. A fifth interchange was added later at Edgemoor to serve an extension of Delaware 3 (Edgemoor Road) and U.S. 13 (Governor Printz Boulevard). Planned as early as 1985, the new parclo interchange (Exits 4A/B) opened to motorists in 1989. The U.S. 13 (Philadelphia Pike) interchange at Claymont was renumbered to Exit 5 in the process. The city of Wilmington otherwise is served by Exits 1 (U.S. 13), 2 (Delaware 9A), and 3 (12th Street). The U.S. 13 (Dupont Highway) interchange saw expansion in 2000 to incorporate new ramps from Interstate 495 south to U.S. 13 north and U.S. 13 south to Interstate 495 north. The Exit 2 parclo with Terminal Avenue serves the South Bridge section of the city and the Port of Wilmington. North of the Christiana River is the diamond interchange with 12th Street, the only exit wholly within the Wilmington city limits. Exit 3 links the freeway with the 12th Street Extension, a two to four lane surface street through eastern sections of Wilmington between Northeast Boulevard (U.S. 13) and Hay Road. As originally envisioned in the 1970s, the 12th Street Connector was to run along the north side of the Brandywine River from Northeast Boulevard to a new bridge at 14th and Poplar Streets, providing a direct route between Interstate 495 and Downtown Wilmington. The Connector was revised in March 1982 with City Planning Commission plans calling for the route to shift northward to cross the Brandywine River at Poplar and 16th Streets.1 Controversy ensued with both plans, and community opposition ultimately led to the cancellation of the project. Unfortunately faulty concrete mixtures used in the construction of both I-495 and Delaware 141 (Newport Freeway) in the late 1970s caused premature cracking on both roadways. Thus instead of a 30-year life span for the road surfaces, each freeway needed repair jobs starting in the late 1980s. A major reconstruction project scheduled for 1991 to 1993 replaced all original concrete with new concrete. The project however encountered numerous delays and finished a year behind schedule. 1996 legislation increased the maximum speed limit in Delaware from 55 to 65 miles per hour. This allowed limits along I-495 to increase to 65 MPH, but under a stipulation in the bill that "Strictly Enforced" placards be included with new speed limit signs. Eventually speed limits along I-495 were made variable, with dynamic signs erected in place of conventional reflective signage, allowing DelDOT to lower the speed limit when needed. 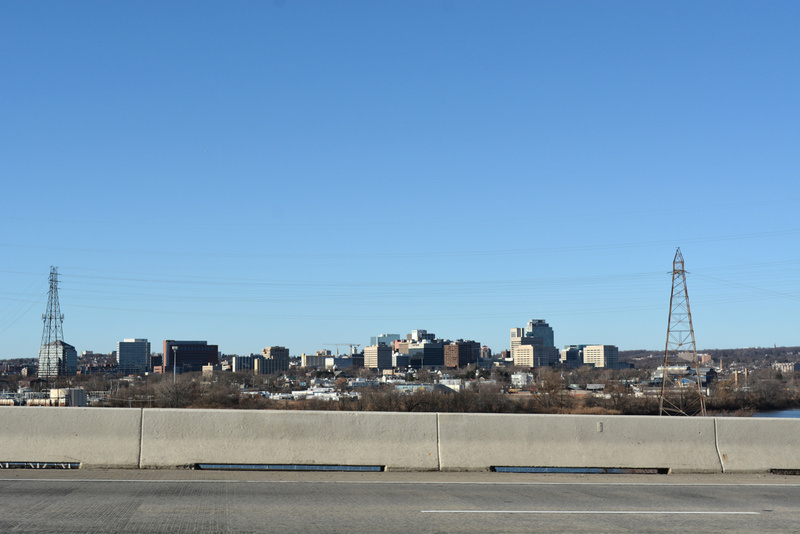 Affording a clear view of the Downtown Wilmington skyline, Interstate 495 spans the Christina River at a height of 60 feet. Photo taken 12/27/16. Hay Road connects SR 3 (Marsh Road), the community of Edgemoor and Cherry Island in Wilmington with Interstate 495 north. Photo taken 12/18/17. "Upper East Side residents fight I-495 connector." The Wilmington News Journal, April 14, 1982. "I-495 bridge traffic could flow by Labor Day." The News Journal (DE), June 11, 2014. "TRAFFIC ALERT - Restriping on I-95 and I-495 Southbound Will Require Nighttime Lane Closures AND Closure of I-295 Off-Ramp." Deldot, Press Release, June 13, 2014. "Southbound I-495 lanes open a month early." The News Journal (DE), August 4, 2014.